A feature documentary about 12 contemporary calligraphers from around the world, their work and their relationship to the written word in the age of digital communication. A huge amount of very pleasurable hard work by everyone involved and the co-operation and generosity of some amazing artists have resulted in a film we are very proud of. Please head over to the website (www.tracesofthesoul.com) to watch the trailer and let’s hope this is the beginning of a great festival run, we hope to see you at a screening near you soon! 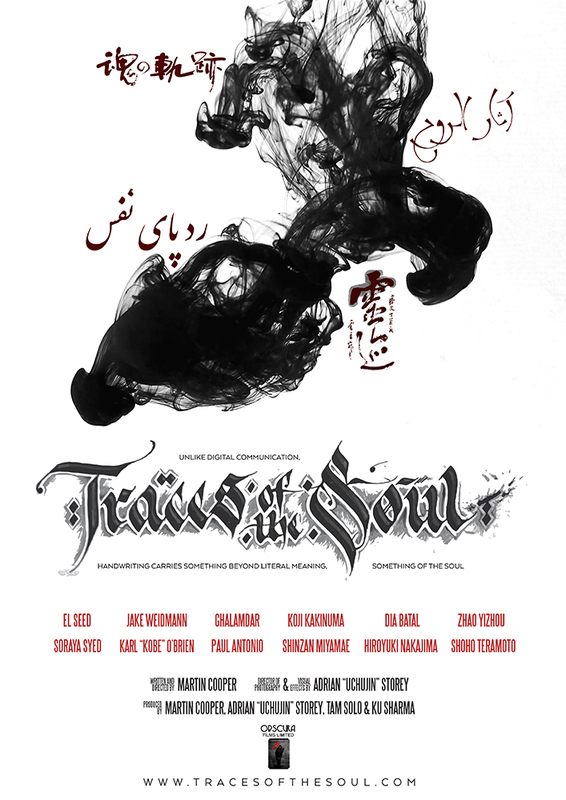 Extra thanks to Karl “Kobe” O’Brien for the main “Traces Of The Soul” logo and to Nakajima Hiroyuki, Zhaou Yizhou and Dia Batal for the Japanese, Cantonese and Farsi versions of the title. The lovely people at StormHD in London where the film was edited, in particular, Paul Ingvarsson the Online Editor and colourist & Dave Ingram the Dubbing Mixer. Additional music by so many amazing artists who provided their music for free under a creative commons license (See the film for full credits).